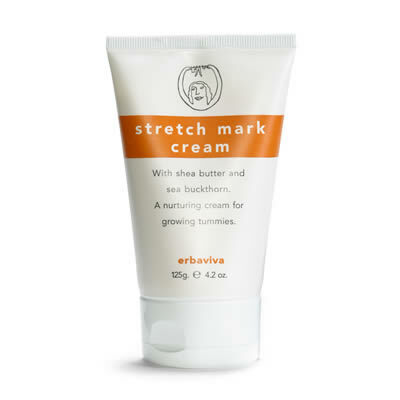 Erbaviva's new Stretch Mark Cream with Shea Butter, Sea Buckthorn and Feverfew extracts combined with the same beneficial essential oils in our successful Stretch Mark Oil for easy application. For best results use in conjunction with Erbaviva Stretch Mark Oil. Use Stretch Mark Cream in the morning and Stretch Mark Oil at night. Water, sweet almond oil, avocado oil, cetearyl wheat bran glycosides (natural emulsifier), algae extract, glycerin, sea buckthorn extracts, shea butter, sodium levulinate, alantoin, potassium sorbate (food grade preservative) Essential oils: organic carrot seed, organic lavender, organic mandarin, rose and sandalwood. Although I cannot comment on any fading of stretch marks, this cream might be helping to prevent them! I do not have any, so far (knock on wood). This is so rich and creamy. It takes time to rub it in, but it is so hydrating- truly unlike any other I have tried. My favorite part is this product is all-natural, free of preservatives and packed full of essential oils. I most definitely recommend this product!! !